Dr Aylish O’Driscoll is a lecturer on the Professional Doctorate (DPsych) in Counselling Psychology, and a practicing counselling psychologist. In her role on the DPsych, Aylish is module leader for the Year 2 Developing Research Skills module, supervises doctoral research, teaches across various clinical modules and is a Year 2 tutor. 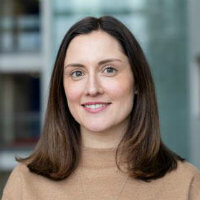 Aylish is also a member of the Psychology Department Research Ethics Committee, and has previously taught on the MSc Health and Organisational Psychology and BSc Psychology. Her research interests lie in the use of qualitative methods to study a range of applied counselling psychology topics, with experience predominantly in phenomenological and narrative approaches. Particular interests include understanding mental health within social and cultural contexts, trauma-informed understandings of mental distress, and the roles of mindfulness and compassion in psychological wellbeing. Aylish currently works part-time in a university mental health service, and has previously held psychologist and senior psychologist roles in the NHS across Inpatient, Early Intervention in Psychosis, and Secondary Care teams. Aylish has a BA(Hons) degree in Psychology from Trinity College Dublin, completed her DPsych in Counselling Psychology at City, University of London, and her Practitioner Training in Cognitive Analytic Therapy at St Thomas’ Hospital in London. O'Driscoll, A. (2009). The growing influence of mindfulness on the work of the counselling psychologist. A review. Counselling Psychology Review- British Psychological Society, 24(3&4).